A former high-ranking diplomat and Clinton ally at the center of an FBI counterintelligence probe was a registered foreign agent for the Pakistani government up until just days before she was appointed to run the U.S. State Department’s Pakistan aid team. 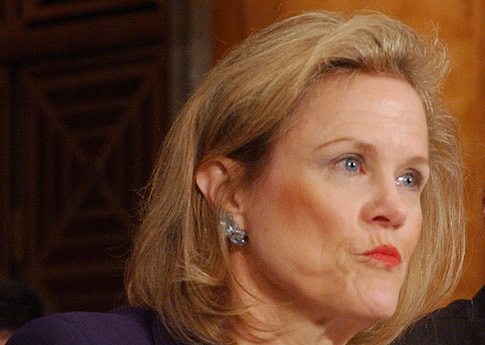 The Washington Post reported last week that the State Department’s aid coordinator for Pakistan, Robin Raphel, is the subject of a counterintelligence investigation and has had her security clearance revoked. The FBI has not specified the nature of the probe, although the Post indicated that it could be espionage-related. She was reportedly placed on administrative leave last month, and the State Department said she is no longer employed by the agency. Raphel previously served as an assistant secretary of state under President Bill Clinton and rejoined the State Department in August 2009 to focus on Pakistan and Afghanistan aid issues. She is also close to Hillary Clinton and contributed $2,000 to her presidential campaign in 2007. From 2007 until 2009, Raphel worked for the lobbying firm Cassidy & Associates, where her clients included the Embassy of the Islamic Republic of Pakistan and the Republic of Equatorial Guinea. Cassidy & Associates stated in lobbying disclosure records that Raphel stopped conducting work for Pakistan in November 2007. The U.S. Foreign Agent Registration office told the Washington Free Beacon that Raphel’s foreign agent registration for Pakistan remained active until July 31, 2009. The State Department announced her appointment as Pakistani foreign aid coordinator five days later. Disclosure forms also list dozens of Raphel’s cab rides between June 1, 2009 and the July 31, 2009 as expenses incurred on behalf of the Pakistani embassy. Ten of these cab rides were for trips Raphel made to the State Department at the end of July. Cassidy & Associates later filed an amendment stating that these State Department visits were "incorrectly characterized" and "were not incurred on behalf of the foreign principal." The firm did not challenge Raphel’s other listed cab rides on behalf of the Pakistani government during that same time period. On August 10, 2009, Cassidy & Associates asked the Foreign Agent Registration office to terminate Raphel’s October 27, 2007 lobbying registration for Pakistan and Equatorial Guinea. The firm stated that Raphel "has not rendered services for these foreign principals since [November 2007 and February 2008]." FARA experts said the discrepancies were unusual, but could be excused as clerical errors and on their own were unlikely to trigger a counterintelligence investigation. "Not standing alone. Maybe [the filings would prompt] a letter of question, nothing more," one attorney who specializes in FARA issues told the Free Beacon. "I don’t think there would be any inference of nefarious conduct based on that." Still, the disclosures highlight Raphel’s close professional ties with the Pakistani government, which critics have cited to claim she is biased against India. Cassidy & Associates waited barely one month after Raphel left the firm before lobbying their former employee on Pakistan issues, meeting with her on Sept. 2, Sept. 26 and Sept. 27 of 2009, as well as several times in November. According to disclosure records, Cassidy & Associates lobbyists had conversations with Raphel about the Enhanced Partnership with Pakistan Act and "aid priorities and funding mechanisms for development in Pakistan." "We are reviewing our filings, but Ms. Raphel has not worked for Cassidy since July, 2009," said a spokesman for Cassidy & Associates. While the Obama administration has restrictions on lobbyists joining the administration, Raphel was not subject to these rules because she was not a presidential appointee. Raphel, a long-time diplomat, is a frequent guest on think tank panels and a respected voice in Washington’s Pakistan policy circles. "I would be flabbergasted beyond belief if she did anything deliberately and knowingly that is illegal," said C. Christine Fair, an assistant professor at Georgetown University and a South Asia policy expert. "I'm appalled by the allegations that have been flung at her without evidence. Everyone should wait for evidence and recall that all are innocent until proven guilty." Raphel served as both assistant secretary of state and ambassador to Tunisia under the Clinton administration. Her first husband, Arnold Raphel, was a former U.S. ambassador to Pakistan and was killed along with Pakistani President Muhammad Zia ul-Haq in a 1988 plane crash. This entry was posted in National Security and tagged Bill Clinton, Hillary Clinton, Pakistan, State Department. Bookmark the permalink.